The dark side of fly tipping is spreading like a plague in the back roads of Romford. Nowhere is apparently safe, but the formation tipping team have located a spot in central Romford where they think they can ‘tip’ lob, or generally throw out of the car door with impunity. Haysoms Close just off North Street is a service road, but more importantly an access road to an elderly complex. Beautifully tree lined and peaceful, the road furniture was given the addition of two builders heavy bags brimming with rotting garden waste and general refuse on Friday May 16. 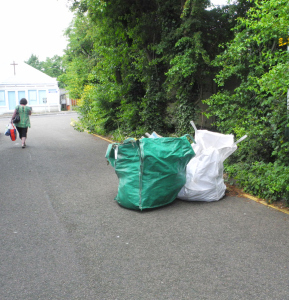 The bag colours do not blend into the beauty of close, particularly as they have been dumped in the road causing an obstruction to traffic. Fortunately, for those who comply with the rules concerning the disposal of rotting waste, Havering Council has specific team just waiting to scramble when the alert rings. Regretfully the champion relied upon by residents of central Romford, Cllr Andrew Curtain, has been deselected thus losing a wealth of experience and a long and noble history of service to the community. It is to be hoped that he will be returned to that august body later this month as an independent. What can be done about this? Is it time for the public exposure of these criminals through a CCTV? Barry Kirk is a Photo-journalist of 40 years experience in news media, Deputy Editor of Romford Recorder and promoted to Editor of sister paper Barking and Dagenham Post. Now freelance with small publishing and photographic services company. He had a just started an Arts Blog for Havering and surrounding areas. Share this: The dark side of fly tipping is spreading like a plague in the back roads of Romford. "> The dark side of fly tipping is spreading like a plague in the back roads of Romford.